Patrice e-mailed me yesterday to say that she'd just found out from a reader that her blog is listed third (THIRD!) on Google if you search for "squash muffins." She ranks just behind the Food Network and AllRecipes.com. The reason she wanted me to know is that I sent that recipe out to all of our female family members after my sister made them for our Thanksgiving lunch about 10 years ago. My sister has no recollection of this at all; I think that was because she was too busy crowing about some sort of dressing she'd made from a box mix, but I'm here to tell you, these muffins she made from scratch are THE BOMB. Now. Hers have green things in them, because she ran out of squash and added zucchini. I have never done that, but she said they were still excellent. She also said that she plans to try replacing some of the sugar with applesauce. To that I say: NO MA'AM, NOT IN THIS HOUSE. I'm sure that removing some of the sugar or butter would make them healthier, but also might make them taste less like The Food of Angels and more like The Food of Horses, and I'm simply not interested in going there. Because Internet, the first time I ever ate them, it was a Come to Jesus Moment. I can even tell you what I was wearing: a grey turtleneck sweater and black pants. SEARED IN MY MEMORY, that meal is. Preheat oven to 375. Wash squash, trim off ends, cut into slices. Cook in boiling water 15-20 minutes or until tender. Drain WELL and mash. Measure out 2 cups of squash and mix with eggs and butter, set aside. Combine remaining ingredients in large bowl, add remaining squash and the squash mixture, stir just until evenly moistened. 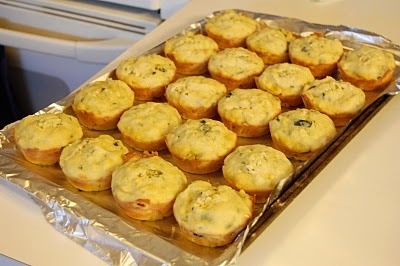 Spoon into greased muffin cups, filling 3/4 full. Bake for 20 minutes or until golden brown on edges (not whole muffin). This recipe makes 18-24 muffins. If you have children who won't eat vegetables or say they hate squash, feed them these. Life-changing. Pinky-swear. I fixed these this past summer....they are yummo! My mom fixed them as well. I tried about half the recipe with chocolate chips and they were also good. Thanks for this wonderful recipe Katherine! What kind of yellow squash do I use? The kind that look like yellow zucchini? Or the ones with the curved neck (is it crookneck, maybe?)? Sounds like something I can get my four to eat (they LOVE pumpkin muffins--have yours tried those?). Sounds good. I might have to try these. But right now I'm to lazy to even go to the store for dinner. I think I'll just order pizza. Is that bad? Leigh, CHOCOLATE CHIPS OH MY. Yum. Amy, I use the kind that are sort of curved at the ends. Butternut? I have no idea. But the sugar will make any kind of squash taste good, I'm pretty sure. SET, yes, I believe it was the Stove Top of which you were so proud. Blech. Laura, so glad you made them! Even more glad you liked them!